BASH (Broad Application Security Housing) is the first of its kind providing the ultimate mobilization security protection for your camera. B.A.S.H.™ - Driving innovation with mobile video protection. Ballistic Anti-Shock Housing™ is the first of its kind providing the ultimate mobilization security protection for your camera. BASH™ was designed to withstand anything that this world can throw at it, literally.BASH’s strength comes from it’s High Impact Lenses and with the optional Armored Reflective Lens you can both hide and protect the equipment inside. It has a unique 12 point floating stabilization system that we’re calling Shell-Shock Vibration Suppression. It’s compact design mounts and looks just like any mountable truck light. The Thermal Temperature Control creates a barrier for your camera that fights against temperature changes from -40 degrees F all the way up to 167 degrees F while allowing the camera inside to operate at its desired temperature. With an IP68 rating, BASH™ can withstand up to 2 meters (6.5′) of water. Its IK10 vandal/anti-theft rating is the maximum security protection and can only be found with BASH™. BASH™ is also multi-camera ready supporting Go Pros, Low Profile PTZs and Minidome cameras. Network and video recording ready provides the highest level of accessibility from anywhere in the world. BASH’s unique design makes it applications limitless with its mounting ability for uses such as boating, commercial fleets, construction crews, utility vehicles, trucks, semi-trucks, utility poles, bridges, ATV’s, snow mobiles, police, emergency vehicles, fire and rescue, border patrol, and so much more. ((BASH)) Original Model includes Mounting Hardware, Universal Internal Camera Bracket, and Uni-Directional Passive Cooling with Solid State Thermal Cooling Disk™. ((BASH)) All-Pro includes Mounting Hardware, Universal Internal Camera Bracket, 2 lens (1 clear high impact lens and 1 tinted high impact dome "bubble" lens), and Uni-Directional Passive Cooling with Solid State Thermal Cooling Disk™. 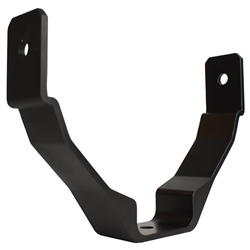 This is a replacement "U" bracket for any of our BASH housings. This would include the mounting bolts to attach the bracket to the BASH housing. Copyright © 2014 Dotworkz Systems. All Rights Reserved. Built with Volusion.